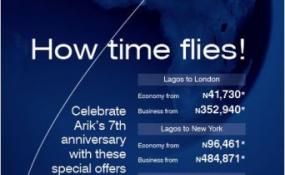 Arik Air, West and Central Africa’s largest commercial airline has launched a special sales promotion to celebrate its 7th anniversary. The promotion is valid on the airline’s long haul routes; Lagos-London Heathrow, Lagos-Johannesburg and Lagos-New York. Guests travelling between Lagos and London will be able to buy a return economy class ticket from N41,730 and Business class ticket from N352,940. A return Economy Class ticket on the Lagos-New York route starts from N96,461 while Business class ticket on the route starts from N484,871. On the Lagos-Johannesburg route, a return economy class ticket starts from N38,199 and Business class from N300,938. The fares are exclusive of all taxes and charges and the last ticket day is November 15, 2013. Outbound travel period is between October 30 and November 21, 2013. Tickets can be paid for at the airline’s City Ticketing Offices and Airport Ticketing Offices within Nigeria and via the airline’s website www.arikair.com or mobile devices m.arikair.com. In addition, tickets can be purchased from any IATA registered travel agent. Copyright © 2013 Arik Air. All rights reserved. Distributed by AllAfrica Global Media (allAfrica.com). To contact the copyright holder directly for corrections — or for permission to republish or make other authorized use of this material, click here.